As most of you know, our special “early bird” registration rates have been set to end tonight at midnight eastern, as “all Hallows eve” turns to “All Saints Day.” Thank you to everyone who has already purchased your pass! However, in the spirit of this most magical of holidays the Ministry has decided to grant a ONE WEEK extension of the early bird period! Early Bird registrations at the $145 rate will remain available for immediate purchase and through our payment plan until Tuesday, November 7th at Midnight Eastern time. At that time registration will increase to our standard rate of $160. We also have a limited number of VIP passes remaining, if you think you want a VIP pass, now is the time to get yours! Click here to reserve your passes now! 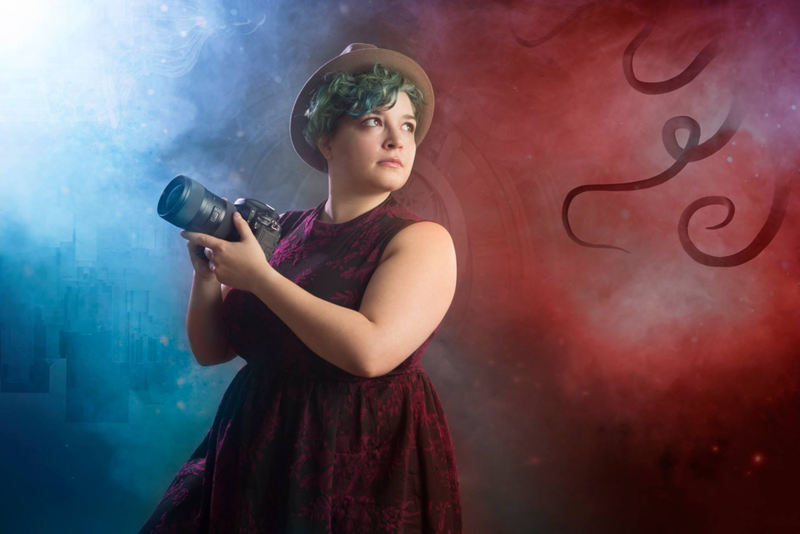 The Ministry is thrilled to announce that Babs Daniels, of Babs who takes pictures will be returning to MISTI-Con to capture your portrait and bring her signature brand of beautiful photography as MISTI-Con’s official photographer. Week 2 of MISTI-Con's Staff Flashback Friday. This is Sarah Wilkes take on her first MISTI-Con. "The story of my first MISTI-Con starts on the road from NY to New Hampshire. I wasn’t as active in the convention as I am today so I drove up the Thursday of the convention with a few friends. In Boston, driving through rush hour traffic, we got side swiped along with 3 cars in front of us when a car behind though the very narrow shoulder was actually another lane. Here I would add a picture that looks like the cover of an indie band album of the 4 of us sitting on the traffic barrier waiting for the police to let us drive on, but that photo is lost somewhere on the internet. When we were finally back on the road, sans my side mirror and making our way to the hotel, I remember thinking that this was definitely the most memorable start to this trip. I have to admit that this convention was the beginning of the road that led me to the position I have today. I’d like to tell you all of the amazing times I had at MISTI-Con 2013 but in the end it was a blur of twizzlers, the smell of pool chlorine, the sound of laughter in the hallways, the look of joy and happiness on the other attendee’s faces and I wouldn’t trade that for anything. MISTI-Con is for everyone from the neurotic over-achiever to the complete introvert looking to be in the company of people who feel the same. At the end of MISTI-Con 2013 after spending a bulk of the convention sitting in the computer room (dubbed the glass box of emotion from that year on) with the head organizers and using my overachieving nature to their benefit, when thanked for my help I demanded to be on the staff the following year (though I probably didn’t need to be very forceful) and I have never looked back." When HPEF announced that Ascendio would be their last HP convention, I started to look for what would be my next one. I started googling HP Conventions and landed upon MISTI-Con. I didn’t know anyone involved with it, which made me nervous. I read through everything on the website, and I liked that it would be a smaller and immersive convention. I met two of the staff in a presentation I did in Orlando, and when they told me they were from MISTI-Con, I figured the universe was trying to tell me something. Within weeks, I booked my room for the next summer, and took a chance. As fate would have it, I volunteered to work on the convention and ended up helping in Programming. I arrived at the convention a day early to help with set-up, but I had never met any of the staff in-person, and this was a bit nerve wracking. I am an ambivert and can be quite shy around people I do not know. However, I quickly learned the size of the convention was perfect for me. I was blown away by the decorations, and being surrounded by HP geeks, and all things Potter. I loved the programming – great academic offerings, amazing fan programming and talented artisans sharing their HP crafting in classes. At the end of MISTI 2013, I was asked to join the staff as a Co-Head Organizer, something that completely took me by surprise. I have been working on MISTI since then. The thing I loved most were the people. There were people I only recognized from other conventions, and at MISTI I was getting to know them. I was relatively new to cosplay and was surrounded by the most incredible cosplayers, and they were sharing their love of HP and costuming and were so willing to help others. MISTI has a fabulous Costume showcase, but it isn’t a judged competition, and they make a place for anyone that wants to be involved. It was a truly magical experience. I am so glad that I took a chance on MISTI, and I have made some great friends through the convention. I can’t wait to see my friends and make new ones at the next MISTI. When MISTI says they are by fans, for fans, it is a great description of the convention. If you are a Harry Potter fan, and are looking for great programming and being surrounded by some awesome folks, I would encourage you to give MISTI-Con a chance. I am so glad I took that chance, because it has become such a big part of my life. We are happy to announce the re-opening of MISTI-Con's Goblin bank. In an effort to help people buy their MISTI-Con registrations we are offering payment plans over the course of 6 months. Visit our payment site for details on Early Bird and VIP registration options. HOTEL INFORMATION & RESERVATION UPDATE! Thank you so much for your support of MISTI-Con. We are within one year of the convention and are excited to start making regular announcements! The code is limited to MISTI-Con attendees so even if you reserve your room before registering, you will need to get a registration before attending! Thanks again for all of your support and we can't wait to see you at MISTI-Con 2019! MISTI-Con 2019 is happy to announce our move to the Doubletree by Hilton in Tarrytown, NY on the weekend of July 18-21, 2019! We have a lot of exciting news to share about MISTI-Con 2019, but before we do so, we wanted to let you know about a change in the con’s leadership. We’d like to once again thank all of you for making MISTI-Con 2017 the best MISTI-Con yet! Because of all of you we truly felt that this convention was about "Coming Home".